ACTION ALERT: Send Congress Your Story Today! At the end of 2017, federal protections for medical cannabis patients and providers hung in the balance. Congress had three times passed stopgap funding measures that included the CJS Medical Marijuana amendment, extending the restrictions on the Department of Justice (DOJ) until January 19. Then, on the morning of January 4, Attorney General Jeff Sessions announced that he was rescinding the DOJ’s 2013 guidance for prosecutors known as the Cole memo, which highlighted federal enforcement priorities and recommended restraint in dealing with state-compliant individuals. The fate of medical cannabis protections will be decided by negotiations between the House and Senate on FY18 Appropriations. Sessions has urged Congress not to extend the protective amendment to the Commerce, Justice, and Science (CJS) Budget Amendment. Earlier this year, the amendment was blocked from being considered by the House Rules committee. First introduced in 2001, the bipartisan amendment has been part of the DOJ budget since 2014. 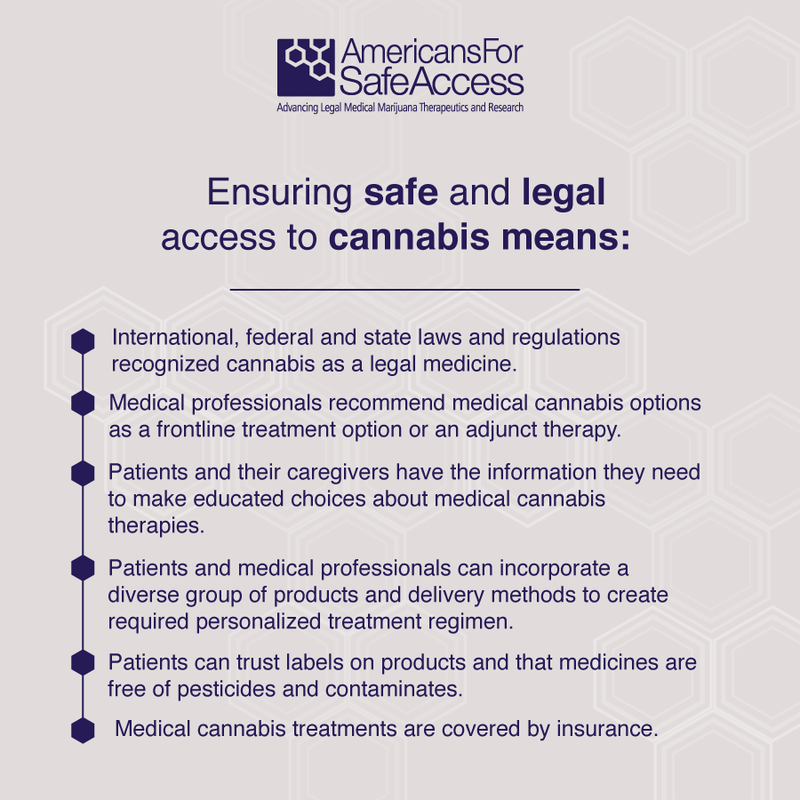 To show the strong bipartisan support for the Rohrabacher-Blumenauer amendment, Americans for Safe Access worked closely with other advocacy groups to get 66 members of the House to sign on to a letter to congressional leadership urging continued protections for state medical cannabis programs. The letter was signed by 28 Republican representatives and 38 Democrats. ASA led a similar letter to appropriations leadership from concerned patient groups, including The Michael J. Fox Foundation, US Pain Foundation, National Multiple Sclerosis Society, Epilepsy Foundation, Tourette Association of America, National Women’s Health Network, and Realm of Caring. As an escalating opioid crisis grips the nation, ASA launched the End Pain, Not Lives campaign to highlight the viability of cannabis as a treatment alternative. 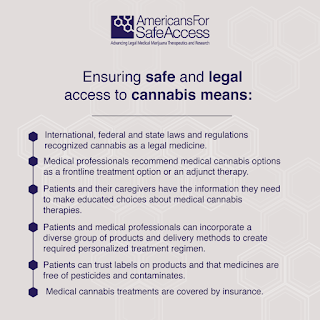 That campaign includes release of a guide for state policymakers, “Medical Cannabis as a Tool to Combat Pain and the Opioid Crisis: A Blueprint for State Policy,” that covers legislative and regulatory solutions, including model legislation, an emergency proclamation, and flow charts that help lawmakers identify barriers to access. Elements of ASA’s model legislation are being implemented in the District of Columbia in an effort to reduce opioid overdose deaths. In tandem with the report’s release, advocates held several rallies on November 1. In Washington, D.C., ASA, the US Pain Foundation, and advocates held a press conference and rally with Congressman Earl Blumenauer (D, OR-03; pictured at right) to encourage policymakers to consider medical cannabis as an option for pain. Advocates then delivered a letter to the leadership of the Senate and House Committees on Appropriations urging them to include the medical cannabis amendment in the FY18 appropriations package. The report and rallies were part of ASA’s response to the President’s Commission on Drug Abuse and Combating the Opioid Crisis. The Commission identified over 50 solutions to the crisis that claimed 65,000 lives in 2016, but omits all the available clinical research data on the safety and effectiveness of cannabis for treating chronic pain. 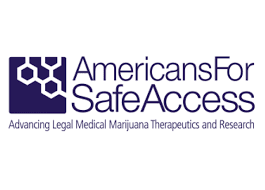 As a result, ASA filed two requests under the Freedom of Information Act (FOIA), seeking disclosure of how the Commission’s draft final report came to include only a single cannabis study that used survey data obtained before medical cannabis programs were operating in the US. ASA submitted formal comments to the White House regarding the Commission’s interim and final reports. ASA also launched a petition urging President Trump to formally declare the opioid epidemic a national health emergency and provided questions to Congressional Members for key Senate and House hearings on medical cannabis and the opioid crisis. In advance of the WHO meeting, the Food and Drug Administration asked for input on CBD and 16 other substances. ASA submitted formal comments on its medical efficacy and urged the FDA to use its traditional rulemaking process to remove CBD from the drug schedules. After months of public pressure, the Drug Enforcement Administration (DEA) early last month removed factually inaccurate information about cannabis from its website. The change comes after ASA filed a legal request with the Department of Justice demanding that the DEA immediately remove it from their website and materials. ASA’s petition argued that the more than 25 false statements on the DEA’s website about cannabis constituted a violation of the Information Quality Act (aka Data Quality Act) which requires that administrative agencies not provide false information to the public and that they respond to requests for correction of information within 60 days. One publication, “Dangers and Consequences of Marijuana,” contained 23 of the 25 factual inaccuracies in violation of the IQA. That publication has now been removed. Held from the 7th-11th at the Omni Shoreham hotel in Washington, D.C., ASA’s National Medical Cannabis Unity Conference included panels and workshops led by leading global experts, such as Dr Ethan Russo. Sessions covered the latest developments in medical cannabis research, treatments, policy, regulations, and advocacy, as well as international developments. Many participants also attend Patient Focused Certification trainings, advocacy workshops, and learned about ASA’s newest educational program for doctors and patients, Cannabis Care Certification. The conference keynote speaker, South Carolina State Senator Tom Davis, inspired the audience with his commitment to passing legislation for patients in his state. On the last day, over 100 medical cannabis patient advocates from 32 states met with the offices of their members of Congress, urging them to support medical cannabis legislation such as the CARERS Act. With help from ASA staff, advocates attended 72 scheduled meetings equipped with the information they had learned at ASA’s conference. At the start of 2017, ASA released its annual scoring of state medical cannabis programs. The report, Medical Marijuana Access in the United States: A Patient-Focused Analysis of the Patchwork of State Laws, shows that no state yet fully meets the needs of patients, but many have improved dramatically. The programs are graded according to a matrix of multiple factors that assess patient's rights, legal constraints, and overall accessibility to medical cannabis, with separate scoring for each factor. The report provides each state with recommendations on their medical cannabis programs as well as ways for states to compare themselves to other state programs and identify ways to improve. As of 2017, no state cannabis laws are within the ‘A’ range. Over the past year, 23 States followed ASA’s recommendations for improvement. Last year, only 11 states obtained a B or above; however, in this new report, 19 states received a B or above. In the area of patient rights, only eight states obtained grades above 80% in 2016, in the 2017 report, 12 states were above 80%. In all, 16 states improved their programs, as measured by ASA’s patient-focused rubric. West Virginia Gov. Jim Justice in April signed Senate Bill 386, known as the West Virginia Medical Cannabis Act. The law goes into effect in July 2018. Physicians who register with the program will be able to recommend cannabis to patients with serious medical conditions ranging from seizures to muscle spasms. Those patients will then register with the state to get access to medical cannabis products through licensed dispensaries. Home cultivation will not be allowed, and smoking is banned but vaporization and other methods are permitted. In Wisconsin, Gov. Scott Walker signed SB 10 into law, allowing cannabidiol (CBD) extracts to be used in the treatment of seizures. The new law, which passed the Assembly 98-0, will cover possession and use of CBD extracts, but the production or sale of it will remain illegal. In Indiana, Gov. Eric Holcomb signed HB 1148 into law, which also allows CBD extracts for treating epilepsy. The governor reversed his position after the bill passed unanimously in the state house and by a 3:1 margin in the senate. State residents diagnosed with uncontrollable seizures and their caregivers can register with the state program to use CBD oil, though there is no provision for production or distribution. Virginia’s restrictive medical cannabis program took a modest step forward when Gov. Terry McAuliffe signed Senate Bill 1027, which passed unanimously in both the Assembly and Senate. The new law, which ASA assisted in drafting, allows the production and distribution of cannabidiol oil (CBD) and tetrahydrocannabinolic acid (THCA) with up to 5% tetrahydrocannabinol (THC). The state Board of Pharmacy is tasked with licensing, which will take at least a year. Virginia’s current law, passed in 2015, provides only an affirmative defense for possession of the cannabis extracts, and only patients with intractable epilepsy qualify. Hawaii Department of Health gave medical cannabis dispensaries the okay to start cultivating in February, and a dozen dispensaries are now serving patients. An expanded medical cannabis program was approved in 2015, and eight licenses were awarded in 2016, with each license allowing two production facilities of up to 3,000 plants each and two retail locations. The Department of Public Health and Social Services for the U.S. territory of Guam began accepting license applications for dispensaries, cultivators, processors and testing labs. Guam Public Health Director James Gillian said patients could have access to medical cannabis by this summer. Public Health also announced that before successful applicants can begin operating, they will be required to enroll in ASA’s Patient Focused Certification (PFC) program. On June 19, President of Mexico Enrique Peña Nieto enacted a bill making medical use of cannabis legal in the country, after it was passed by overwhelming votes in both the senate (98-7) and Mexico’s lower house (374-7). The law directs the Health Ministry to create regulations for producing low-THC cannabis products for patient use. Cannabis cultivation for medical and scientific purposes will be legal. Shortly thereafter, the director of ASA’s Patient Focused Certification program met with officials from Mexico’s Department of Health and presented a talk on medical cannabis at the invitation of the national institute of pediatrics (pictured). PFC is translating ASA’s educational materials into Spanish and will be training the country’s health officials through the Cannabis Care Certification program on how to draft and implement sound regulation. PFC has also been asked to work with the governor’s office in Mexico City on drafting health and safety guidelines. The German parliament unanimously passed a medical cannabis law at the start of 2017, which went into effect in March. Physicians are allowed to prescribe cannabis for multiple sclerosis and other severe conditions such as chronic pain and nausea. Eventually, medical cannabis will be cultivated through a new state-regulated program, but the medicine may be imported until then. In a press conference at the end of June, the Prime Minister of Greece announced that his will become the sixth European country to allow medical use of cannabis. Greece will down-schedule cannabis to allow doctors to prescribe it for a variety of medical conditions. No plans to allow cultivation or distribution have been announced, but import of cannabis products from the Netherlands or elsewhere could begin soon. Other countries in Europe that recognize medical use are the Czech Republic, Finland, the Netherlands, Portugal and Spain. ASA’s two education and training programs went global in 2017. The Patient Focused Certification and Cannabis Care Certification programs participated in talks, trainings, and the development of standards from the Czech Republic and Spain to Israel and Mexico, as well as across the US and Canada. In Canada, PFC presented on international cultivation standards this month as part of the annual meeting of the International Cannabinoid Research Society (ICRS). In Spain, PFC certified the country’s first cannabis distributor, worked with a doctor’s office, and conducted a weeklong training attended by representatives from 10 countries. The PFC program certified 20 cannabis businesses for compliance with best practice standards and trained hundreds of industry professionals in California, Delaware, Florida, Maryland, Ohio, Pennsylvania, Tennessee and the District of Columbia. In addition to the 10 multi-day in-person trainings, PFC also launched an online training program for industry professionals at pfctraining.org. PFC’s webinar series included leading experts such as Ethan Russo, M.D., one of the world’s leading experts on cannabis medicines and John MacKay, who shared his 30-years of experience with laboratory analytics. PFC webinars appear online every other Thursday and are archived on ASA’s YouTube channel. PFC is also producing facebook live events, including Cannabis Science Corner and a bi-weekly podcast. PFC was part of launching a cannabis committee within ASTM International, the 119-year-old standards organization. PFC was invited to provide input at the preliminary meeting in March, and PFC director Jahan Marcu, Ph.D. was named chair of the ASTM subcommittee of 50 experts developing standards for education and training and criteria for regulatory assessment. These standards will determine how the cannabis industry will function – who gets licenses, who gets trained and how. PFC currently provides personnel training, SOPs and third-party certification under state and private contracts. Standards developed by ASTM will be integrated into PFC’s international certification program. Cannabis Care Certification (CCC) also went global this year. In Israel, Dr. Marcu made two presentations to Cann10, the second international medical cannabis conference on matching cannabis varieties to individual patients based on matching human genetics to plants. Dr. Marcu also conducted ‘grand rounds” at Temple University Hospital, discussing with the attending physicians, residents, and medical students educational resources available through CCC. CCC also launched its Patient Education Program for dispensaries and clinics, which will provide free education to all patients. If you want this free educational program, please ask your nearest dispensary to sign up for the program here. Congress and the Administration need to hear your story. When Attorney General Sessions rolled back the protections of the Cole Memo for medical cannabis patients, he created new risk for patients and made Congressional action even more critical. We need your stories and your voices to get Congress to take action immediately. They must pass the CJS medical marijuana amendment as well as laws such as the CARERS Act that will protect patients from the current and any future Attorney General. Please create a short video, using your phone or computer, to help us lift up your voice and your story to the Attorney General and to Congress. Go here to Submit your video today!